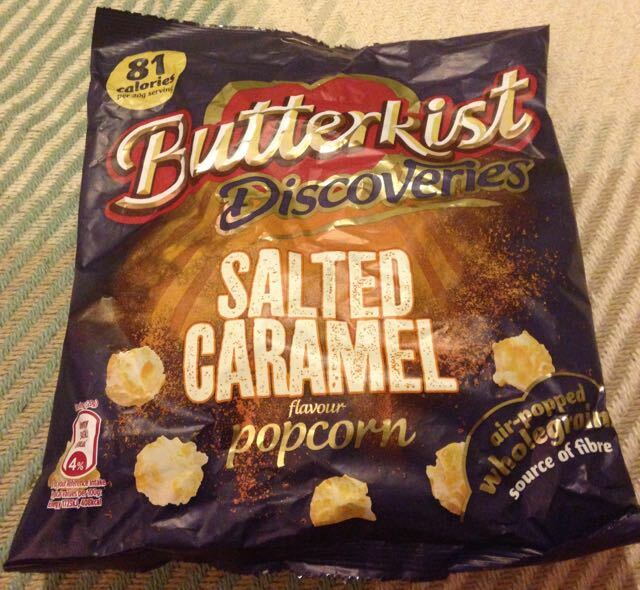 This Butterkist Salted Caramel is part of the Discoveries range, which includes Chilli and Lime flavour and also Pulled Pork flavour*, which Cinabar reviewed a few weeks ago. I decided to sit down one night and try this Salted Caramel flavour with a good film. I have mixed feeling about Salted Caramel as a flavour. It seems fairly new on the snack market. Some salted caramel flavoured products taste a little too salty for my liking, others I can barely taste the salt, and some taste just plain weird. On opening the packet these Salted Caramel popcorn had the usual full Butterkist covering, which always makes me smile. 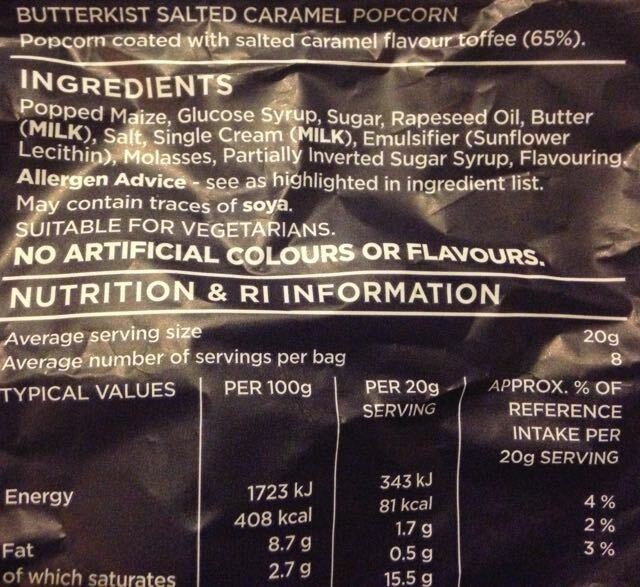 Some popcorn manufacturers are a little stingy with their popcorn flavour coverings, but never Butterkist. 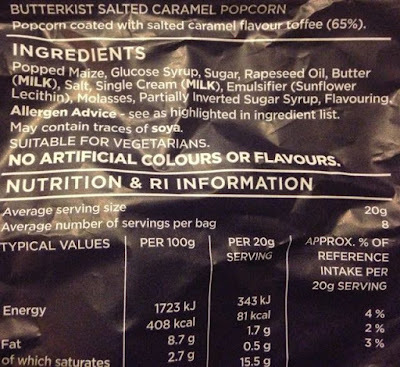 Having said that, if these Salted Caramel popcorn taste in the weird category and with an overpowering amount of flavour, this could be a bumpy ride. On first crunchy bite their was a decent caramel sweetness to these popcorn, with the salt nudged its way into the sweet caramel flavour politely. Almost courteously in a way the salt taps the shoulder of the sweet caramel instead of rudely barging passed into the tastebuds. Here the caramel and the salt complement each other perfectly, rather than an overpowering saltiness or tasting just plain weird. Big bag for sharing also, but who would want to? I'm just greedy!! 160g bag has 81 calories per 20g serving, with 1.7g of fat, 9.4g of sugar and 0.35g of sugar. No artificial colours or flavours. Please see photograph for the ingredients.